Earliest copies of ACL 7 had an RIAA mid- '50's LXT transfer. This has a wider dynamic-range than either of those/original issue. thanks a lot, dear Tin Ear. this kind of records does deserve 24/96 or even more. and, of course, agree with your note, that some later re-releases have far better sound. e.g. the (in)famous Beethoven's 9th recorded live from Bruno Kittel's jubilee concerto by Furtwängler released on sine data (cca. 1960-61) Melodiya vinyl by the All-Union Recording Studio (Всесоюзная Студия Грамзаписи) in the ultra-rare bright blue gatefold album having black seals with silver inscriptions is unrivaled either by all the previous and later releases in its crystal clear sonics. 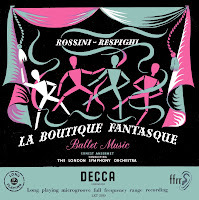 Maybe it's on CD - but I transferred 3 early ACL (Boult/Tchaikovsky - that now on CD - and the Desormiere S.Beauty/Sylphides - the latter work not on CD) - so just happened to choose this (the Irving Cid/Patineurs is also worth transferring). These titles have the advantage of the EMI BTR2 tape-machine - and even if that wasn't used to replay them in 1958/9 the extra clarity is quite noticeable (Krips Brahms 4/Tchaikovsly/Ricci are 2 others that are excellent in later LXT transfers)...and you can see a very extended treble here. Fortunately the performances are good (especially the Boult 1812/Hamlet)!! 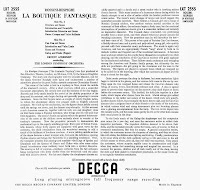 Some later mono Ansermet are pretty detailed as LXT's: Jeux/La Peri (the fanfare is very brilliant) / Tchaikovsky 6 / Lalo+Ravel - Ricci / Petrushks - 1st 1958 mastering. NB; used a Decca cartridge for this. On CD: 1999 on Japanese London POCL 4634 - 10 CDs "The Art of Ernest Ansermet (Monaural Recordings" - see for example http://homepage1.nifty.com/classicalcd/japanesecd/decca/ernest_ansermet_mono.htm, 05/2002 on Somm SOMM CD 027, see for example http://www.musicweb-international.com/classrev/2002/July02/RRS.htm. I don't know the quality of these CDs. My sleeve scans date from March 2012 - and didn't know of the Eloquence CD - but the MusicWeb review suggests my LP transfer is superior, as ACL 7, in these matrices, certainly doesn't suffer from 'unclear/congested sound'..although I still don't think that even 24/96 completely captures the LP 'quality' . A CD-R I made for a BBC Announcer, some few years back, I thought disappointing - and suggested that a MiniDisc might sound 'more alive' ; the BBC Library only seemed to have the Decca 'Eclipse' 'stereo' LP; and I wonder if >that< tape (like the Coq d'Or, below) was the source used for the CD ??? Thank you for this transfer, the 24/96 sounds wonderfull to me, I love this Rossini/Resphighi work and Ansermet was fantastic. I'm just working on a ACL also and sound much better than the original LXT and I always have the same question . Did later reissues of the original LXT preserves the original playback curve or a later pressing uses RIAA?. Thank you. PS: Decca cartridge sounds incredible good to my taste. Depends which ACL. They incorporated recut LXT transfers dating from 1956 onwards (ie ACL 78 Firebird - on the other blog - has Ansermet's R.Espagnole side from the 1956 recut LXT 2627 and the Nocturnes on that appears on ACL 106 (c/w La Mer) - except the 2nd transfer (2Er) is used instead of 1Er - both likely made @ the same time .. ie; the recut 'Trout' Qnt has alternate 1/2 on LXT/ACL pressings. 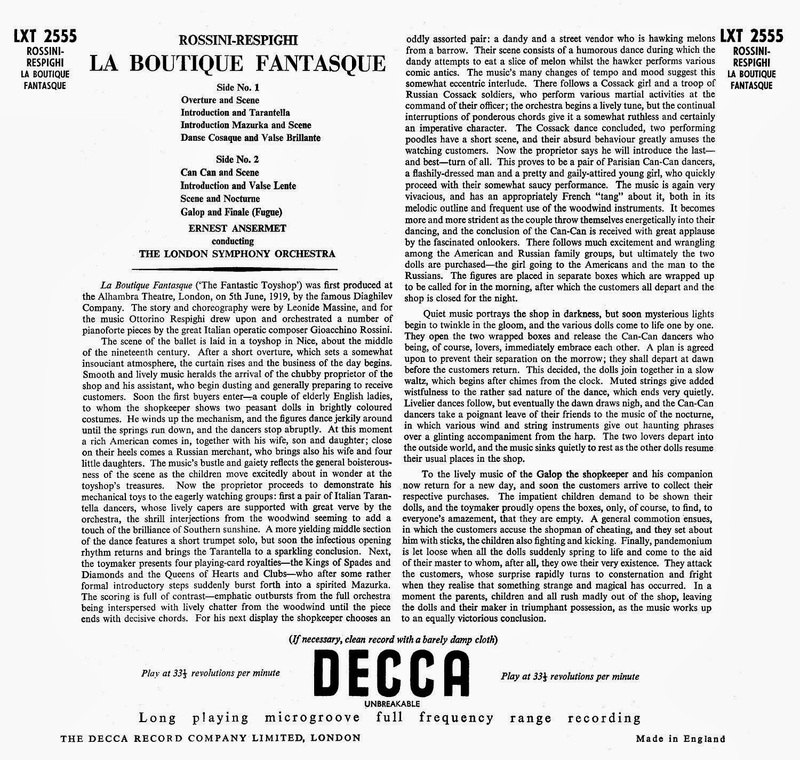 Although the small metal type matrix info guarantees it's RIAA I think Decca re-equalised the tapes to 'brighten' them - so although the 2nd Ansermet Boutique mastering is RIAA (large type: 2Dr/2Dr - which dates it to 1955) it's nowhere as bright as the 1958 mastering - although Decca may have installed new mastering equipment late 55/early 56 which improves the treble. This can make it difficult to know whether to 'adjust' the EQ when transferring - as, using a Decca cartridge, they tend to sound 'too bright' - as the treble goes to 30kHz with these early tapings. There still a problem transferring this Decca vinyl - as there are 'soft ticks' caused by, probably, the silvering of the lacquers - but I remove 'most' - as there's no point doing a 24/96 (or 16/44..) and then reducing the original resolution by 'noise-reduction'. The mono Israel/Solti transfer on ADD sounds rather good too..and the SDD is apparently better sounding than the original SXL (which I don't have). Thank you! The 24/96 sounds very good indeed! 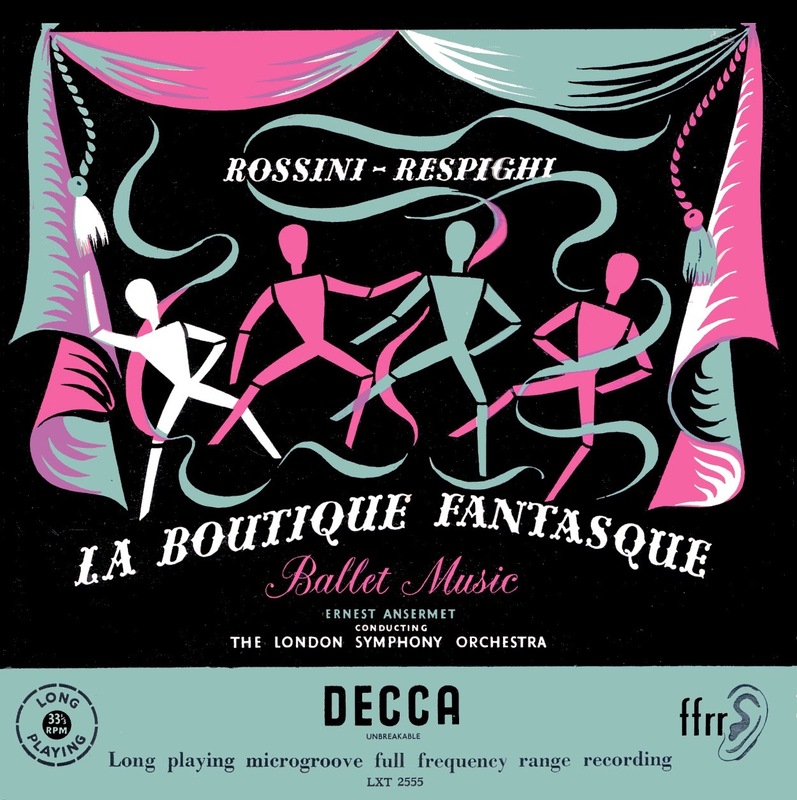 Here's what Warren DeMotte had to say in "The Long Playing Record Guide" - "Rossini's melodies are a gold mine for orchestral arrangers, and this collection is one of the best. Ansermet has magnificient vitality yeet never lets the music get out of hand. Galliera puts on a lively show, well recorded. Kurtz is exuberant. Rignold is rough. Not sure if the Galliera was the stereo Philharmonia ? - which I don't really like...the others are not in my 'pile' (the Sargent/RPO is: he decided the Gold Mine needed cutting-back - rather drastically.